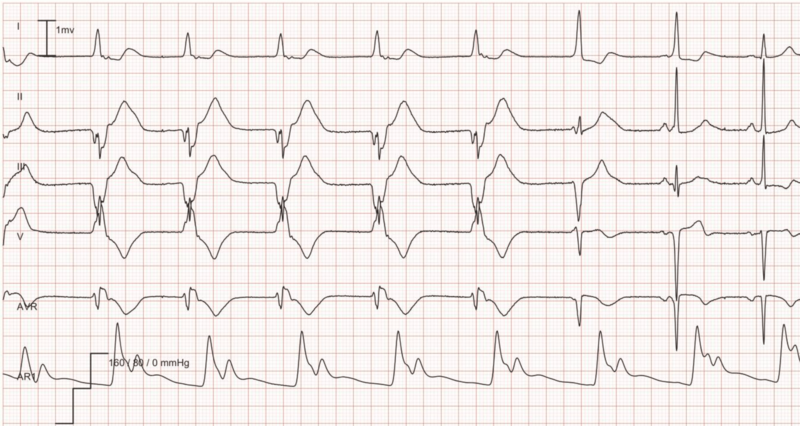 In this article you will learn about ventricular rhythm and accelerated ventricular rhythm. The latter may also be referred to as idioventricular rhythm. These arrhythmias are important to recognize on the ECG. Ventricular tachycardia is discussed in the subsequent article. Accelerated ventricular rhythm, which is also called idioventricular rhythm. The hallmark of all ventricular rhythms is the wide QRS complex (QRS duration ≥0.12 s). The QRS complex is wide simply because the ectopic impulses that cause these rhythms spread partially or entirely outside of the ventricular conduction system, and thus the ventricular depolarization is slow (yielding a wide QRS complex). Because the ventricular depolarization is abnormal, the repolarization will also be abnormal (read about secondary ST-T changes on ECG). 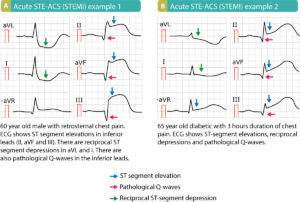 Hence, all beats and rhythms arising in the ventricles will display discordant ST-T segments, meaning that the QRS complex and the ST-T segment will have opposite directions. Figure 1 provides an example. One exception to the rule above should be noted. 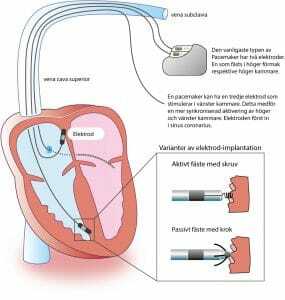 If an ectopic focus arises in or near the bundle of His, the impulse may be delivered to both bundle branches and subsequently the entire ventricular myocardium normally. This may yield a ventricular rhythm with narrow QRS complexes. However, this is very uncommon and of little clinical significance. The usual mechanisms are responsible for all ventricular rhythms. Increased automaticity (in His-Purkinje fibers), abnormal automaticity (in contractile myocardium), re-entry (anywhere) or triggered activity (anywhere) may all cause ventricular arrhythmias. Indeed, any cell type in the ventricles may cause ventricular arrhythmias. Ventricular rhythm exists if 3 or more consecutive beats have a ventricular origin. The ventricular rate is between 20 to 40 beats per minute and the rhythm is regular. There is always secondary ST-T changes, meaning that the ST-T segment is discordant (Figure 1). Ventricular rhythm typically occurs during complete heart block (third-degree AV block). Importantly, ventricular rhythm is not a reliable rhythm as it may cease working. 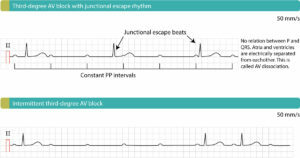 Figure 1 exemplifies a ventricular rhythm. 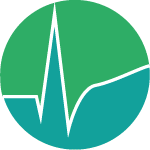 Accelerated ventricular rhythm (idioventricular rhythm) is a rhythm with rate at 60–100 beats per minute. 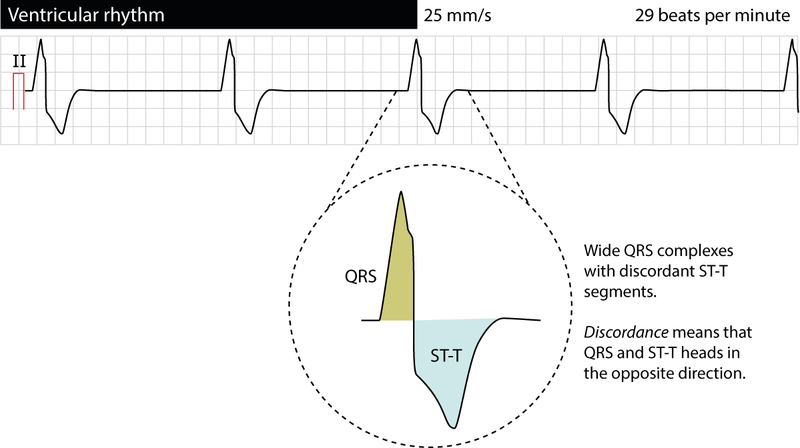 As in ventricular rhythm the QRS complex is wide with discordant ST-T segment and the rhythm is regular (in most cases). Idioventricular rhythm starts and terminates gradually. It occurs in other situations than does ventricular rhythm; idioventricular rhythm is primarily seen after reperfusion in an occluded coronary artery. It also occurs as side effect of drugs, hypoxia, myocarditis and electrolyte disorders. 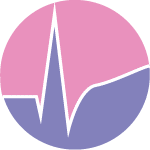 Because the rate (60–100 beats per minute) is on a par with the rate in sinus rhythm and there is atrioventricular conduction, these rhythms typically compete which is seen on the ECG with sinus rhythm alternating with accelerated ventricular rhythm. As mentioned in the previous paragraph, idioventricular rhythm is very typical during reperfusion and in that scenario it is a good prognostic marker because it signals that coronary blood flow has been restored. Note that in that setting the idioventricular rhythm may appear with varying QRS morphologies (i.e multifocal ventricular complexes). In virtually all cases (particularly in myocardial ischemia) idioventricular rhythm is benign and does not demand treatment. It does not progress to ventricular tachycardia or ventricular fibrillation and it does not affect cardiac output to the point of hemodynamic compromise. Figure 2. Idioventricular rhythm (accelerated ventricular rhythm). Asymptomatic patients need no treatment. Idioventricular rhythm is virtually always transient and returns to sinus rhythm spontaneously. Patients with ventricular rhythm with inadequate cardiac output are managed as patients with bradycardia. By administering atropine, the supraventricular impulse rate may increase which may take over the ventricular rhythm as well. View all chapters in Cardiac Arrhythmias.